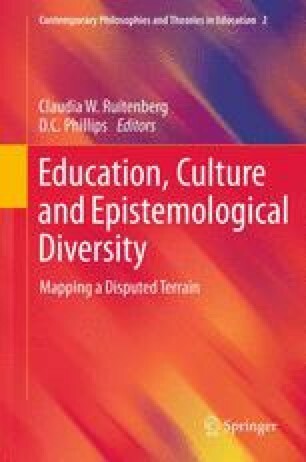 Over the past several decades, there has been a trend to argue in support of important multicultural educational reforms using the language of epistemology. The relevant literature, however, extends the meaning of “epistemology” in ways that obscure rather than clarify the valid issues that are at stake, and furthermore, the matters that are the focus of traditional epistemology – which are important in their own right – also tend to be obscured by such a strategy. The discussion opens by identifying four senses in which the term “epistemology” is used; the first of which refers to the traditional branch of philosophy in which normative issues are pursued that pertain to how belief can be distinguished from knowledge; the second is as a term referring to the specific positions that have emerged on such matters within philosophy (e.g., “positivist epistemology,” “non-foundationalist epistemology”). These two usages are overlooked in much of the multicultural epistemology literature. In the third (and non-philosophical) usage, “epistemology” refers to a descriptive account of how people acquire beliefs, and in the fourth usage, it refers to the actual sets of beliefs that different individuals hold. During the discussion, standpoint philosophy and sociology of knowledge are touched upon.